SeaStar Solutions Optimus 360 is a joystick docking and control system for Mercury Verado six-cylinder digital throttle and shift outboards. 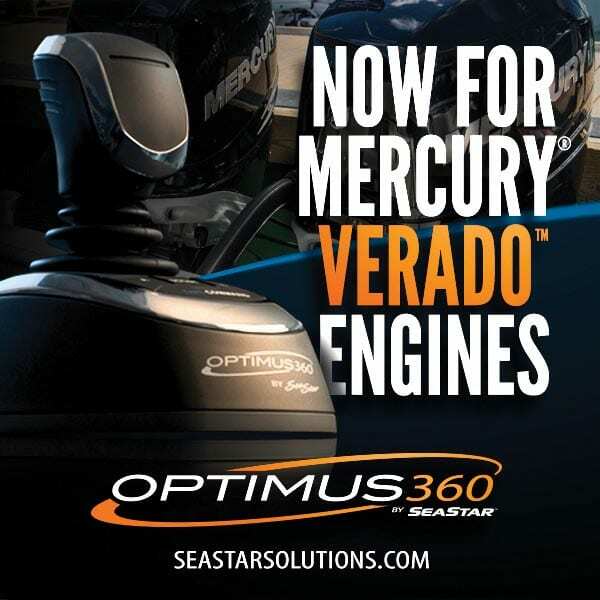 Now, owners of Verado outboards can enjoy the benefits of Optimus 360 joystick control technology for close quarter maneuvering as well as Optimus EPS (Electronic Power Steering), SeaStation GPS Anchoring and SeaWays Autopilot capabilities. The full SeaStar Solutions Optimus 360 system has been designed to integrate seamlessly with Verado outboards. A specially-designed SmartStick sensor and magnet fit on the existing Verado hydraulic steering cylinder for a clean, unobtrusive install. Importantly, the sensor assembly does not affect existing clearances for tilt and trim in the transom area. Optimus 360 for Verado is available on new boats or can be retrofitted on existing vessels by select boat builders or an authorized Optimus installing dealer. Retrofit installation requires removes of the factory helm, hoses and power assist pump and replacement with the Optimus electronic helm, Optimus hydraulic pump and hoses, NMEA 2000 harnesses and CANtrak display. SeaStation and SeaWays systems require the additional installation of a GPS compass sensor and software update. For information on SeaStar Solutions Optimus 360 for Verado outboards or for the name of an installing dealer, visit www.seastarsolutions.com.